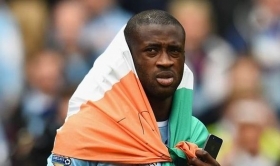 Manchester City boss Pep Guardiola could offer a year's extension to midfielder Yaya Toure following his impressive showing for the club in recent seasons. Toure, 33, had had a shrewd relationship with Pep at former club Barcelona, and this suggested that he would struggle for playing time after the Spaniard took over the reigns last summer. However, it was not meant to be the reason for the midfielder's exclusion after his agent Dimitri Seluk appeared to blast the manager for the mistreatment of his client. According to The Sun, the Ivorian footballer will be offered a fresh one-year deal with his contract due to expire at the end of the season. Toure was visibly one of the best players on the pitch during City's 2-1 loss to Arsenal in the FA Cup semi-final last month and his performance appears to have kept him in good stead with the Catalan tactician. The 33-year-old has appeared in nearly 300 outings for Manchester City to date - winning two Premier League titles in the process.